Some say that behind every tasty cookie, there is a smiling mother with flour on her apron. We do not know whether it is because there is a whole bunch of smiling people behind Kurabiinica, who skillfully combine traditional recipes with innovative ingredients. 🙂 Our inspiration is the belief that well-fed people with real food are better and happier. That’s why in 2012 we created Kurabiinica – your faithful companion, a reward for the senses and sweet inspiration. Today we continue to turn our inspiration and love into gourmet cookies that can really make your day. This, however, is not the end of a beautiful fairy tale, but rather the beginning of a delicious friendship. So today you can discover this piece of home-like cosiness and start together on an adventurous journey. Your faithful companion, a reward for the senses and sweet inspiration. Kurabiinica is with you. There is no secret ingredient in our cookies. There is a lot of love and care. The rest you can find on the label. 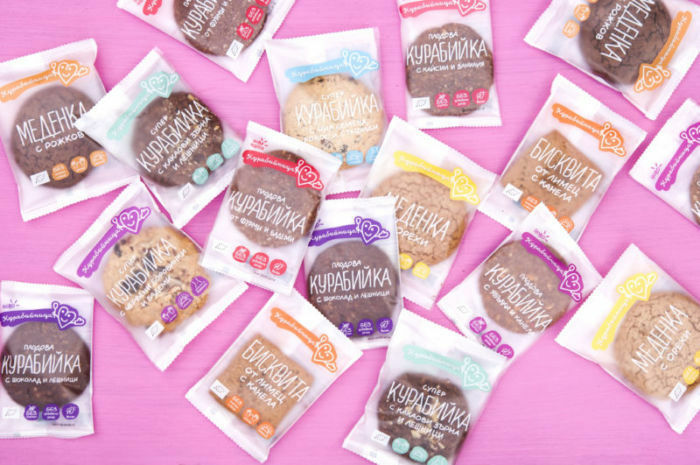 Each of the gorgeous cookies is handmade from the purest Bulgarian products. These super cookies, gingerbreads and biscuits are not meant to just keep your hunger off. A bite takes you back to your grandmother’s kitchen when you first wanted to prepare something for the people you love. The kitchen, where no compromise with quality is ever made. The food that is not look perfect but tastes better than anything you have ever tried.